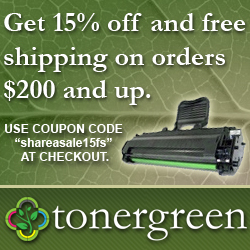 A Proud Affiliate of TonerGreen through ShareASale Network | TonerGreen - Eco-Friendly Toners from the U.S. This blog has recently been accepted to be one of the affiliates of TonerGreen.com through the ShareASale Network. Being an affiliate of TonerGreen gives you a chance to earn 15% commission rate by just using TonerGreen advertisements on your website and reaching potential customers. There are also additional discounts and promos being offered by this eco-friendly remanufactured laser toner cartridge store which are exclusive to its affiliates, like the $5 cashback on all orders that is instantly rewarded to members who have successfully signed up as TonerGreen’s partners. Earning with TonerGreen and ShareASale is so convenient and easy too since the TonerGreen advertisement tools such as the banners and text links can attract any printer user without too much effort. All you have to do is maintain your website and keep the purchases coming. Go ahead and be a partner now to enjoy the perks that this blog has been receiving since it joined TonerGreen’s affiliate program.